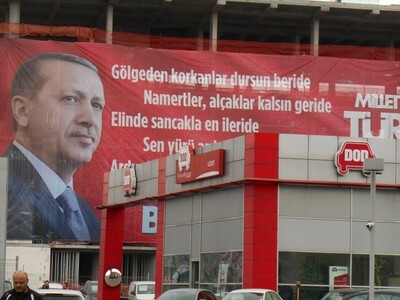 Driving into Istanbul from Ataturk International Airport, the image looms, enormous and omnipresent: the stubbornly stern face of Turkish Prime Minister Recep Tayyip Erdogan. "I've spent a lot of time in Libya and Iraq," one Turkish businessman told me of the billboards along the roadside and banners hung from buildings several stories high. "It's Gaddafi and Saddam all over again." In truth, it's not quite the same: the posters and flags are only temporary here, strung up before the local elections on March 30, and presumably to then be taken down. And smaller, less authoritarian (and less intimidating) banners depicting opposition party leaders also wave throughout the city. But in a fiercely contested election, and amid a political crisis that has splintered the Turkish people, many find the images of Erdogan frightening, a symbol of an Islamic dictatorship that threatens to destroy the nearly 100-year-old secular Turkish Republic, oft-lauded as the only Islamic democracy in the world. "America is focusing on Putin," my businessman friend says. "But Erdogan is much more dangerous. He is Muslim Brotherhood. He hates Jews, Zoroastrians, and atheists. He wants only Islam." Indeed, recently, Erdogan, who has long blamed his troubles on "the Jewish lobby," has now taken to grouping atheists in with terrorists. And hinting at a conspiracy against the government, former economy minister Zafer Caglayan, also a member of the ruling AKP, or Justice and Development Party, declared at the climax of the graft corruption scandal that has gripped Turkey since last December 17, "I would understand if a Jew, an atheist, a Zoroastrian would do all these things to us. Shame on them if these things are done by those who claim to be Muslim. How can a Muslim do this?" Tie such remarks in with Erdogan's strong support for Egypt's ousted Muslim Brotherhood President Mohamed Morsi and the money-laundering schemes and illicit gold-for-oil deals with Iran at the center of the corruption scandal, and Erdogan and his AKP buddies appear quite threatening, indeed. True, not everyone agrees with my friend's assessment of Erdogan as being "more dangerous than Putin;" but among the country's intellectual, secular elite there is a strong sense that their prime minister has become desperate, and will do virtually anything possible to retain power. Already, he has banned Twitter after tapes allegedly linking him to the graft case were leaked and broadcast there and on YouTube, which was shut down in Turkey today. European Union Vice President Neelie Kroes called it a "desperate and depressing move," and asked "Where will it end Mr Erdogan?" in separate Twitter posts. And while Sunday's elections are local, not national, the entire country is aware that a win for the AKP will be a win for Erdogan. As Burak Bekdil, a columnist at Hurriyet Daily, told me, "Erdogan will definitely view any national vote around 45 percent as a sacrosanct vote of confidence and approval of his authoritarianism which in that case will surely gear up with the aim of crushing the most vocal ones among the 55 percent. I fear street violence and police brutality, not just bans on social or conventional media or restriction of other freedoms." Bekdil also points to the prime minister's "ideological solidarity" with the Muslim Brotherhood as a growing problem for the West. As Kadri Gursel observed last August in the Al-Monitor, "The AKP leader and his close associates have been attributing more than ideological kinship to their close ties with the Egyptian Muslim Brotherhood. They see it as a historic and strategic partnership that seeks to establish a new order based on solidarity with Brotherhood branches throughout the eastern Mediterranean basis and the entire Sunni Muslim world." That connection, especially with the prospect of an AKP win on Sunday, could also raise tension with the West. In an e-mail, Hurriyet Daily editor Barçin Yinanç speculated, "the fact that the West has remained largely indifferent to the coup in Egypt against the Muslim Brotherhood has left a scar in the mentality of the AKP, which thinks that there is no tolerance for political Islam in the West, and so will arrive at the conclusion that the West will be against AKP as well." Then again, Erdogan is no fan of the West, either – least of all, America, home to his former ally-turned-nemesis Fetullah Gulen (on whom he also blames the current crisis), and to Twitter and You Tube – both of which he has sworn to "eradicate." Moreover, reported Today's Zaman (which, it should be noted, is owned by Gulen), "Erdoğan described Facebook and YouTube, which he maintained to have been abused by his political opponents, as a threat to the nation at a joint broadcast of A Haber and ATV news channels. Talking about the recently passed amendments to the Internet law, widely criticized at home and abroad for censorship, Erdoğan made it clear that he did not find the restrictions on freedoms and the violation of privacy introduced by the Internet law sufficient. The prime minister said: '[…] There are other steps we will take following March 30.'" Hurriyet's editors are evidently equally concerned – and not just about censorship . According to a March 27 op-ed by columnist Semih Idiz, "But if [Erdogan] gets the numbers he wants, we can expect an even worse witch hunt than the one underway, as Erdoğan and his ministers unleash his already highly apparent fury on those he considers his enemies. Meanwhile, his enemies will not rest either and we can expect even more unsavory revelations about Erdoğan and government members. "The real fight, whatever the results of Sunday's elections, will be for the presidential elections this year and the general elections planned for next year. I have said it before here. The bottom line is the stronger the AKP comes out of these elections, the more turbulence we can expect in Turkey." That view is shared by most of the others I've spoken to in Istanbul in recent days. Some of the country's most prominent industrialists – people who have been particularly outspoken in their opposition to Erdogan's policies – are deliberately lying low, fearful of what may come. Moreover, while both Bekdil and Yinanç seem to feel that further Islamization of the country under Erdogan is unlikely, it is not, they say, for lack of desire on his part – or that of his supporters. "Further Islamization was partly the result of over self-confidence on the part of Erdogan," Bekdil says. "With survivability climbing up in his list of priorities and the social/collective reaction he has faced since Gezi, [such things] should have told him that he should rethink 'raising devout generations.' But this 'ideal' will never disappear from his political genes." For this reason, Bekdil – and many others – express a real fear for the future of Turkey's so-called "Islamic democracy" – a term Bekdil considers a mistake. The West, he says, "should give up on the 'Islamic democracy' endeavor. With an Islamic democracy, where you end up is where we in Turkey have ended up. Is it too difficult to see that?"